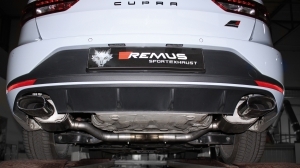 Right now the REMUS R&D center is doing a cat-back-sportexhaust system for the brand new Seat Leon Cupra ST. The perfect adjustment of back pressure and gas flow as well as sound and design will be finalized very soon. In the next days you will receive the full customer information regarding this latest product from REMUS.